What is “the cloud?” This is certainly a question you’ve asked or wondered. You may have received a few explanations too. When searching online, the first resulting definition used the words “Paradigm” and “Ubiquitous” … this does not clear things up for me. Let’s take care of that. If you’ve hear about “the cloud” you’ve likely heard the phrase “on premise” as well. If not, that’s ok. Defining both will help understanding each of them. So what exactly do those terms mean? Simple. Cloud vs On Premises is where your data is stored or resides. On premises data is housed locally in an environment that you (or your trusted IT vendor) maintain. Data is on your computers or servers and is easily accessible. Cloud is similar to its name. Data in the cloud resides offsite, somewhere outside of your home or office. Typically it is on a server, in a data center, miles away from you. Cloud data is accessible to you via a web browser or application. Whew! Now that we have defined the differences, let’s go over a few of the Pros and Cons of keeping your data in the cloud versus on premises. So… Which is the right for your business? 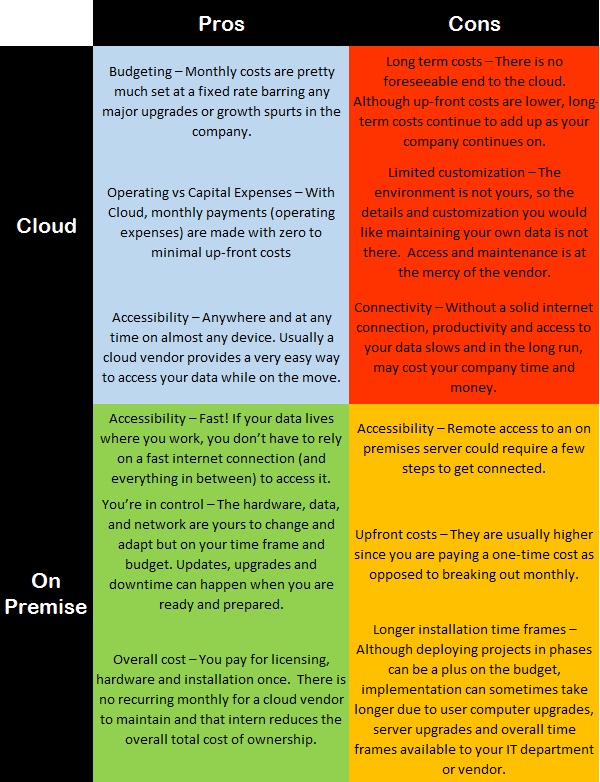 Capital vs Operating Expenses – Can you afford the upfront investment in an on premises solution or the long-term total cost of ownership in a cloud based solution? Backup and Disaster Recovery – Do you have the correct solution to ensure your data is backed up and easy to access if needed? Can you recover a single file if it’s accidentally deleted? How do you recover the whole system? Security – Do you have security requirement to fulfill? Is your data secure, protected and in the right hands? Does the solution meet compliance? Who is responsible to find out? The Upgrade Cycle – Is it important to have access to the latest and greatest version of your software? Or do you want to wait for the bugs to get worked out first? Hopefully this has helped provide a baseline understanding and may have kicked up a few questions of your own. Let us know! As a UniVista Core or Comprehensive customer, your Account Manager is already thinking about these upcoming decisions in your budgeting season. We can help go over these options, answer any other questions you have and help you to make an informed decision.